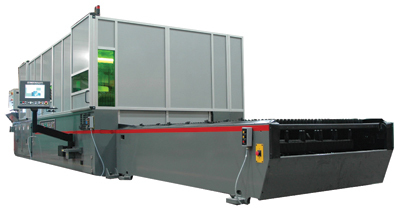 Cincinnati Inc., Cincinnati, OH, has expanded its laser-cutting product line with the introduction of the CL-900 series fiber-laser cutting systems. The systems combine the low operating cost of fiber lasers with the company’s high-performance 12,000-in./min. linear-motor axis drives to create a productive, economical laser-cutting system for sheetmetal processing. CL-900 series machines reportedly cut mild steel two- to three-times faster than conventional machines, while reducing operating costs by as much as 40 percent. Their solid-state fiber laser minimizes maintenance costs, compared to conventional CO2 lasers, by eliminating the need for laser gas, internal optics, glassware, blowers and vacuum pumps. Also, fiber lasers deliver the beam via a flexible glass fiber—no need for external mirrors, bellows and beam purge gas. Fabricators can spec CL-900 series systems with bed sizes of 5 by 10 or 6 by 12 ft. They carry a PC-based HMI control that comes standard with Cincinnati’s programming and nesting software, to optimize machine performance. As an option, add a web cam to monitor the cutting process online.